HA NOI (VNS) — Stocks advanced steadily yesterday afternoon, fuelled by a strong blue chip recovery. On the HCM Stock Exchange, the VN-Index rose nearly 8 points to close the session at 546.85 points. The VN30, which tracks the top 30 shares by market value and liquidity, added 1.17 per cent to end at 576.13 points. Blue chips led market gains, with 19 stocks in the VN30 gaining over 1 per cent, while the other 11 jumped more than 2 per cent. Financial and banking stocks were the biggest gainers. Insurer Bao Viet Holdings (BVH) and Ocean Group (OGC) hit their ceiling prices, while lenders BIDV (BID) and Vietinbank (CTG) rose 3.5 per cent and 2.9 per cent, respectively. However, waning liquidity continued to be a major concern which could prevent the market from a stable uptrend. Both market volume and value declined 30 per cent from the previous session, totalling just 90 million shares worth VND1.4 trillion (US$65.4 million). Only 19 out of 308 stocks across the market saw trading rise above 1 million shares, with FLC Group (FLC) leading the way with 13.5 million shares traded. FLC finished up 1 per cent to end at VND10,600 ($0.50). 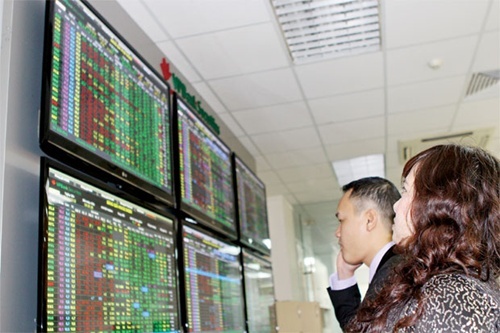 On the Ha Noi Stock Exchange, the HNX-Index also gained 1.4 per cent to finish the session at 81.60 points. With 24 shares rising over 1 per cent and 16 growing over 2 per cent, the HNX30 which tracks performance of the biggest stocks in terms of liquidity here jumped 2.15 per cent to finish at 153.64 points. Cautious sentiment also drove liquidity down here, with just 33 million shares worth VND412 billion ($19.3 million) traded by the end of the session. F.I.T Investment Co (FIT) continued to be the most active code in Ha Noi yesterday with 4.7 million shares exchanged, pushing KLF Joint Venture Global Investment Co (CO) into second place. While FIT soared 6.3 per cent to VND17,000 ($0.79), KLF rose just 1.1 per cent to settle at VND9,100 ($0.43).